Nothing has taken the automotive world by storm in 2015 more than Dodge’s Hellcat powered Challenger and Charger. For those old enough to remember the original muscle car era, these Hellcats made 2015 seem like it was 1970 all over again when horsepower reached Mount McKinley levels only to drop soon thereafter. The problem with the 2015 Hellcats was there were at least 5 times the buyers than there were available Hellcats. Most potential buyers didn’t even get to see one in person since they were sold as fast as they arrived at Dodge dealers. The good news is Dodge is planning an encore presentation by offering its (2-door) Challenger SRT Hellcat and (4-door) Charger SRT Hellcat again for 2016. So there will be another chance for the many who missed-out last model year. The more good news is that Dodge plans on doubling Hellcat production to at least 8,000 units for 2016. Leather seats and the uConnect navigation/entertainment system are now standard. The bad news is that MSRP base sticker prices are going up by as much as 9% for 2016. For the Challenger SRT Hellcat this means the base price jumps from $58,295 to $62,495 (if equipped with the 6-speed manual transmission). 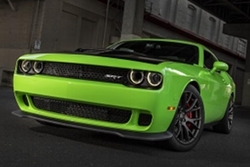 The 8-speed automatic transmission equipped Challenger Hellcat will have a base price of $65,490. The Charger Hellcat for 2016 will have a base price increase from $62,295 to $65,945. Additionally just like last year the Charger Hellcat is only available with the 8-speed automatic transmission. In other words if you want a third foot pedal you’re going to have to opt for the Challenger Hellcat. To Dodge’s credit before the run of last year’s Hellcats was completed, it implemented a policy of penalizing its dealers who attached dealer markups to Hellcat sticker prices. What this means is that 2016 buyers will pay no more than sticker price for a Hellcat. The bad news is that the pool of buyers will probably be much higher due to Dodge mandating no price markups. Dodge has left the 707 horsepower and 650 lb-ft of torque 6.2 liter supercharged (Hemi) Hellcat V8 engine unchanged for 2016. This means that the earth shattering performance of last year’s Hellcat models stays the same. The Charger version will remain the fastest production 4-door sedan in the world with a top speed of 204 MPH. The Challenger version also remains top of the heap in its segment with a 202 mph top speed. There will be no exterior or interior design changes for either car for 2016. Chrysler is remaining hush concerning the rumors that the Hellcat lineup will be expanded to include one new model. It is a strong possibility at some point during the 2016 model year a Hellcat version of the Grand Cherokee SRT will hit the streets. What is known is that Chrysler has registered (on Jeep’s behalf) the “Trackhawk” name with the US Patent and Trademark Office. A secret car show displaying future Chrysler offerings took place in Las Vegas back in August of this year. Present at that show was a Hellcat powered Jeep Grand Cherokee SRT Trackhawk. Unfortunately attendees of the event were not permitted to take pictures (as reported by allpar.com) so there are still many unknowns about the Trackhawk. 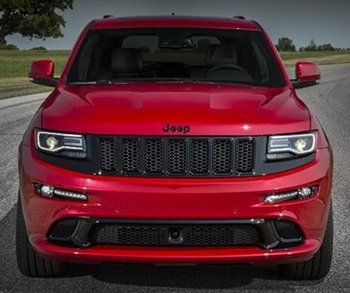 Logically the Trackhawk will be a Hellcat version of the existing Grand Cherokee SRT. Current rumors have the base price at $79,995 or somewhere in that neighborhood. With that said it will be a bargain since the Trackhawk will be the fastest production SUV in the world reaching an estimated top speed of 200 mph. Additionally it is a given that the Trackhawk will use an all-wheel drive system to get the Hellcat engine’s power to the pavement thereby improving off-the-line traction and may even make the Trailhawk the fastest accelerating of the Hellcat vehicle offerings. As previously mentioned 2015 was 1970 all over again, and 1970 is back again for 2016. Hopefully 1970 will keep repeating again and again for the foreseeable future. « Has Ford Caught the GM Front-Wheel Drive Virus?